The Riker was first manufactured by the Riker Electric Motor Company in New York (USA) 1896. Designed by A.L.Riker the vehicle was to prove a success at racing. His first electric vehicle was a 2-seater phaeton that despite being competed against several petrol engined cars won a race at Providence. The vehicles continued to be sporty and in 1900 a special low-slung torpedo racer was manufactured. This instantly established a number of records for electric cars, including the mile in 1 minute 46 seconds. 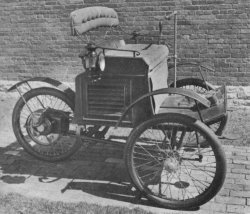 From 1899 Riker also produced a 4-seater vehicle and a truck. In 1900 Riker merged with the Electric Vehicle company and only the trucks continued to be made under the Riker name with production ceasing in the same year. A.L Riker joined the Overman Automobile Company in 1902 and designed cars and trucks for Locomobile.